The Skyrider 2.0, engineered by Italian aerospace interior design company Aviointeriors Group, was introduced at Hamburg’s Airplane Interiors Expo this month. Each year a fresh batch of concept drawings and patents emerge for airplane seating configurations that look more like re-creations of medieval torture chambers than seats. The seats and configurations appear to be impossible Draconian notions that could never make the leap from paper to plane, and for that we’ve all been thankful. Meet the Skyrider 2.0. The name, right down to the 2.0, makes it sound like a cool device out of “Star Wars.” Who wouldn’t want to climb upon something called the Skyrider and zoom through the air? I’ll tell you who: Anyone in their right mind. The Skyrider 2.0, engineered by Italian aerospace interior design company Aviointeriors Group and introduced at Hamburg’s Airplane Interiors Expo this month, puts passengers in a near-standing position, with their backsides positioned on sharply tilted polyester saddle/bike seat. It’s like a petite perch that puts you in a near-standing position for the duration of the flight. For airlines that have been trying to shed weight and save on fuel costs by introducing thinner seats and eliminating seatback screens, the Skyrider 2.0 makes perfect sense. 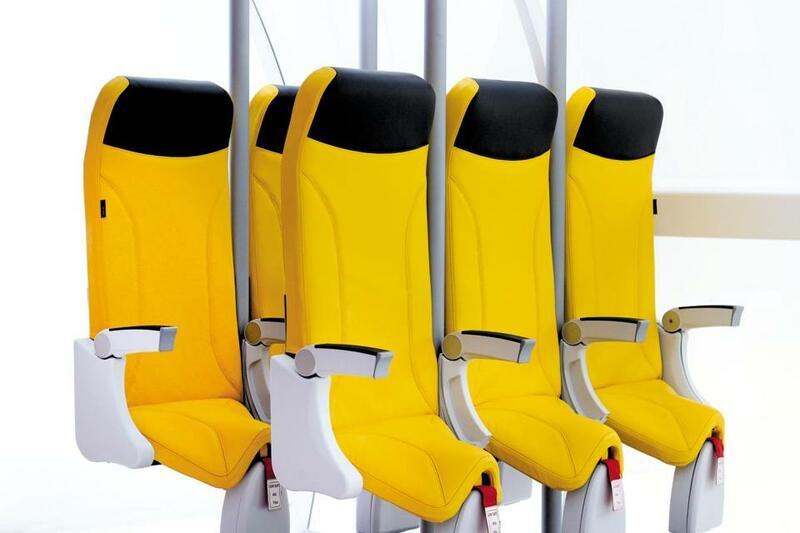 According to Aviointeriors, the design allows a 20 percent increase in passengers per flight. It also weighs 50 percent less than a standard economy seat, lowering the fuel cost per passenger. “Skyrider 2.0 is the new frontier of low-cost tickets,” Aviointeriors declares on its website. It continues on an altruistic note, saying that these seats will allow those who couldn’t afford to fly in the past an opportunity to finally do so. The reduced legroom brings the seat pitch (the distance between one seat and the next in front) down to 23 inches. By way of comparison, the seats on low-cost, low-rated Spirit have a seat pitch of 28 inches. Of all the new innovations on display at the Airplane Interior Expo, the Skyrider 2.0 garnered the most buzz. I think the buzz comes from the frightening fact that of all the kooky and painful-looking seat designs that have emerged in recent years, the Skyrider looks like something that could fit nicely in the interior of a low-cost airline. Heck, the seats on display were Spirit Airlines yellow. It also fits neatly into the trend of business class growing posher while economy gets more spartan. To compete with budget carriers, big league airlines such as American and United introduced basic economy in 2017. Basic economy takes away “amenities” such as the ability to choose a seat or bring a carry-on onboard. Budget airlines could strike back at the majors and lower fares further by adopting the Skyrider 2.0. At which point major carriers would be forced to counter back by installing the Skyrider as well. Are you listening Margaret Atwood? I’m practically writing your next scary dystopian novel all about air travel. No company has announced that it will adopt the Skyrider 2.0, but there has been an air of resignation around the subject of standing seats since Ryanair first expressed interest in a more punishing version of the Skyrider eight years ago. Complain all you like about tight seats on airplanes in 2018, but if — or more likely when — the Skyrider 2.0 and its ilk rule the skies, we’ll be looking back at this time as a golden era of aviation. Christopher Muther can be reached at muther@globe.com. Follow him on Twitter @Chris Muther.